Here’s today’s press release from John Banks, and a transcript of his speech to Parliament. ACT Party Leader John Banks today challenged the Green Party to stand by its principles on animal welfare. Mr Banks says if the Greens truly care about animals, they should make a commitment to vote against the Psychoactive Substances Bill if Mojo Mathers’ amendment to rule out animal testing fails. “There is simply no justifiable reason for unnecessary drugs to be tested on animals. They are not a lifesaving medicine, or something that will relieve suffering. People take these substances just for fun. “Evidence shows animal testing is not necessary to prove the safety of mind altering chemicals, yet poor beagle puppies are being bred so these drugs can be tested. “These puppies will be put in extreme pain, they will suffer and many will die – just so people can take recreational drugs on the weekend. I find that completely unacceptable. “Green MP Mojo Mathers’ amendment to rule out animal testing for psychoactive substances is sensible and has my full support. But what if her amendment fails to get the numbers? “The Greens have not made any commitment to vote against the Bill and may end up supporting it regardless. That’s not good enough. “I have campaigned for animal rights all my life and that’s why I am taking a stance against this Bill. If the Greens truly believe their own animal welfare policies, they should follow suit,” Mr Banks said. I rise to oppose the Psychoactive Substances Bill. This bill is well intentioned and aimed at ensuring psychoactive substances sold in New Zealand are as safe as possible. I want to pay respect to the Minister Todd McClay for his noble intentions with this bill. However, I simply cannot support it. 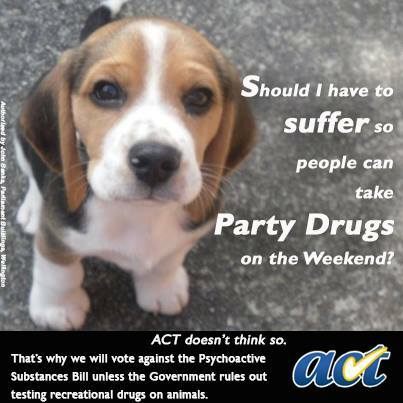 I find it totally unacceptable that this bill fails to rule out testing these recreational drugs on innocent animals. Protecting animals is ingrained in my soul. I think most New Zealanders will be outraged at the idea that chemicals people use ‘just for fun’ can be and will be tested on harmless animals. Animals will be put in extreme pain. Animals will suffer. Animals will die. We must remember psychoactive substances are not a necessity. Recreational drugs are not something one needs to consume. They aren’t lifesaving medicines or something that will relieve suffering. People don’t NEED to take them. Their prolific use will cause widespread animal suffering. There is simply no justifiable reason for unnecessary drugs to be tested on animals, and I for one find it deeply offensive that any Government would sanction it. Animals will be in pain and will die all in the name of people wanting to take drugs on the weekend. That is simply unacceptable. Animals must not experience suffering for economic or entertainment reasons. I know the Select Committee inserted a new clause in the bill to state that animal testing should only be used when necessary, but that is not good enough. Especially considering the Select Committee refused to hear from organisations such as SAFE and the RSPCA about the impact of animal testing. Evidence shows animal testing is not necessary to prove the safety of these mind alerting chemicals. Dr Ian Shaw of the University of Canterbury says non-animal testing can adequately establish whether a substance has unacceptable risks of acute toxicity. Cell culture, ex vivo and SAR studies can all be used to establish the risks. Even if animal testing was necessary, and I know the vast majority of New Zealanders will agree with me on this, I say tough luck to the drug manufacturers and their drug dealing distributors. If you can’t prove your new found drug of choice is safe without putting animals in abject misery, you can’t sell your drug. If you need to pay more for more expensive non-animal testing, again I say tough luck. That is the price you, who stand to profit from selling these drugs, must pay. The reality is the bill could well result in drugs being test on animals in place such as China and India where animal welfare is shamefully non-existent. The statement in the bill that overseas testing must be carried out in accordance with the New Zealand Animal Welfare Act is nonsense because there is no way for us to assess what goes on in the torture chambers of animal testing laboratories in Asia. Despite assurances from former Minister Peter Dunne, this bill fails to rule to the use of the extremely cruel LD50 test. These animal testing places test their drugs on man’s best friend – dogs. Or, more specifically, farmed Beagle puppies. These animals trust us, and expect to get care and love. It is obscene. I also want to comment on the Interim Psychoactive Substances Expert Advisory Committee, and one of its members Bob Kerridge from the RSPCA. The committee was tasked with advising about the use of animal testing. Some have said that Mr Kerridge’s place on the committee and the committee’s view that animal testing should be condoned reveals that animal welfare groups support this bill. Nothing could be further from the truth. Those who have fought for many years for the rights of animals, such as SAFE and the RSPCA are outraged by this bill and it is disingenuous to say anything different. Finally, I want to thank Mojo Mathers for her work on this bill. I will be supporting her amendment to prohibit the use of data, collected from testing on animals here or overseas, being used to support an application to get a psychoactive substance approved. It is a sensible amendment which will protect defenceless animals. But I say to her and her Green Party colleagues, if your amendment at Committee stage fails to get the numbers, you should vote against this bill anyway. The Green Party has been very vocal in its animal rights stance. If you truly believe your own policies you should be standing against this bill. We are sacrificing Beagle puppies at the altar of recreational drug use. It is a disgrace to this country. As the most powerful creatures on this Earth, humans have a responsibility to protect all animals from senseless, worthless and shameless cruelty at all times and in all places. Thanks, John, for speaking out for those who can’t speak out for themselves. Thanks to you, too, Mark (and Lindsay Mitchell) for speaking out on this issue.